Manchester City Manager Roberto Mancini pleaded with the club’s fans to lay off Carlo Tevez. The Argentinean rocked the club last week by handing in a transfer request which has since been rejected. The Eastland’s outfit face Everton tonight and Tevez is expected to play some part in the game. This will be the striker’s first appearance for the club since announcing that he would like to leave. “The fans should continue to support a team like they have in other times,” said Mancini. “We should forget this (Tevez affair) because we must focus on the next game. “The next 20 days will be very important. “Carlos is a football player. He loves football and he plays like when we were young and in the garden. Mancini’s side lost on both occasions last season against the Toffees. The Italian will be hoping for a win this time around which could see them top the league table over Christmas for the first time since 1929. 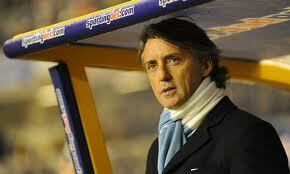 “They (Everton) beat us two times last year, so I remember it very well,” added Mancini. “It will be a difficult game and a tricky game. “We can play very well and strong. We can only beat them if we play like this.